The Old Goat is finished. I finished him up earlier in the week and have just taken a couple of photographs. 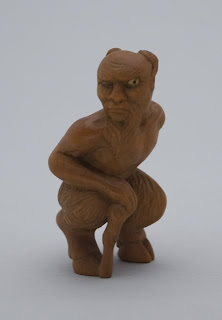 The sculpture measures 1 7/8 inches (5cm) high. 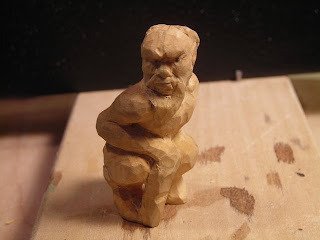 He's carved in boxwood and then colored. 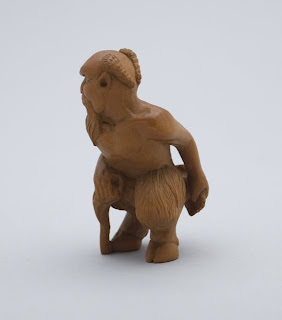 The subject is an old satyr, half blind and crippled - He's just heard a distant call, or caught a scent in the air and is stopped in his tracks with his ear to it, trying to discern. Is it a nymph? I'm satisfied with this piece as it's the first time I've tried to carve the human figure and I think it didn't come out too bad. 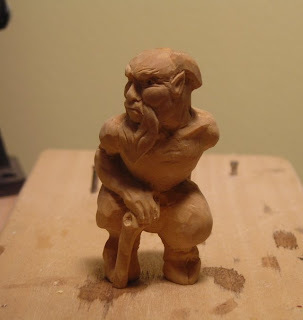 More importantly, I'm happy with the overall quality of the carving and the finishing. 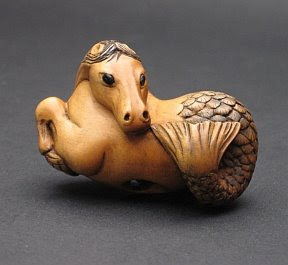 Lately, I've been thinking about netsuke- both contemporary and antique and have begun to think that many of today's pieces, though showing extreme talent, creativity and care, have become just a bit too precious and rarefied. The directness and vitality of earlier works is becoming lost- it's almost if we're entering a baroque phase with this type of carving. 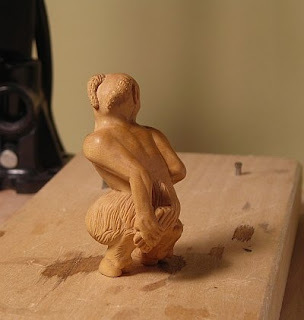 Some have become figurines. So, keeping that in mind, I wanted to stress the directness of carving with this piece- not sanding and polishing out too many details and facets of the knife cut. 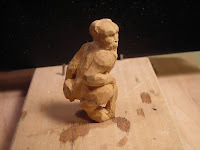 This is afterall a carving in wood, with edge tools, and should show it. I've noticed with some of my work lately that the sanding and polishing process dulls the work- both visually and impact-wise. 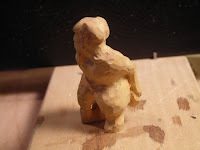 The impression becomes watered down from an earlier phase in the creation, after the carving work has ended and I'm on to sanding and refinement. Let me know what you think. In the meantime, I'm on to ideas for the next piece from what I learned by this one. Note: I've updated this post 6/9/09 to show better photographs. Here's the next set of pictures of the on-going work. The carving is finished and the piece is mostly polished through. A bit more time with polishing and then coloring and it'll be finished. I finished this hippopcampus last week. 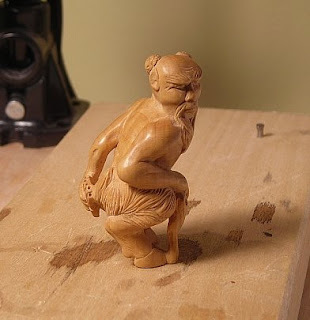 It's carved in boxwood with a light staining, and sumi to pick up some of the details. The eyes are horn. 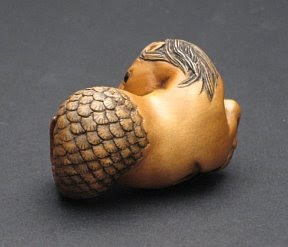 I have to say, the most fun was plotting out, carving and dyeing the scales of his hindquarters. 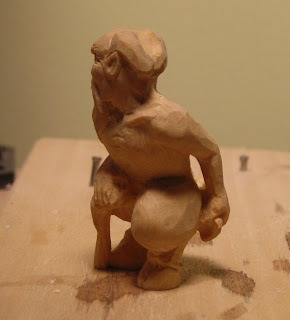 I started this little fellow yesterday and am happy with the way things are coming along, so I thought I'd break with tradition and show a couple of photos taken at the carving bench.